Lapis. Its everywhere. Now that you have your fancy pickaxes with fortune enchantments you have stacks of it. Its completely useless in every way, unless you want hundreds of blue sheep. 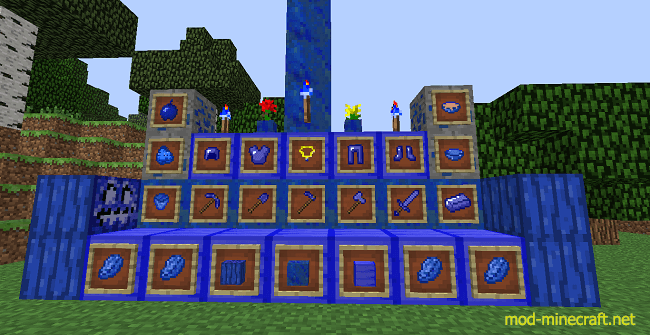 With this mod you can now use lapis to do useful things!This mod adds a variety of lapis goodies including armour, tools and even ingots to craft them!The tools and armour in this mod are crafted like normal tools and armour, using a lapis lazuli ingot as the tool material which can be made by smelting a lapis lazuli block in a furnace. This mod requires Forge. To install this mod just drag the .zip floder into the mods folder created by Minecraft forge in .minecraft.